Demons love a well-designed space station. 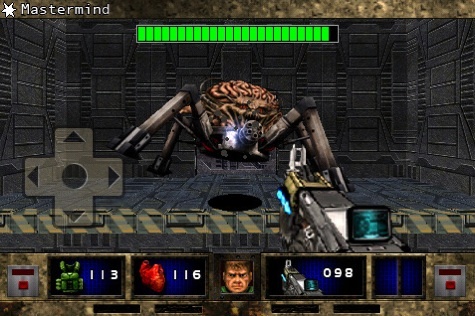 After successfully launching Wolfenstein RPG on the iPhone, id Software's back with another quality role-playing experience, based on its hit PC classic, DOOM II. This first person and turn based shooter not only looks impressive, but is also generally fun to play, thanks to 11 different enemies and over a dozen weapons to kill them with. Most importantly, DOOM II RPG retains the spirit of DOOM, with the usual keycards to open doors, terrified scientists and a space station under siege. This time, however, you have three characters to choose from: Major Kira Morgan, Scientists Riley O'Connor and Sergeant Stan Blazkowicz, who bears an uncanny resemblance to the hero from Wolfenstein 3D. Each person has unique stats spread across five categories (defense, strength, accuracy, agility, IQ), but we were hard pressed to tell the differences between them. The story, of course, follows in the DOOM tradition, as a space station sends a distress signal after being overrun by monsters from Hell. Unlike the first DOOM RPG, though, it's a much richer experience, complete with multiple characters and plenty of dialogue that adds depth to the narrative. You'll even run across people (and even computers) you cannot trust. There's also a ton of loot to collect, mostly off the bodies of dead monsters. You'll find just about everything, from ammo to health packs to snacks. On the flip side, there's a bunch of useless junk, like pocket lint and necklaces made of human teeth; folks who hoard things will enjoy stuffing their hands into crates and bullet-riddled flesh. Battling enemies is the game's biggest highlight. Everything happens from a first person perspective, except you use a d-pad to move around the playfield and take turns attacking demons that respond by clawing your face off and hitting your character with fireballs. To be successful, you'll need to recognize a monster's weakness and use the best weapon for the job, whether it's a double-barreled shotgun, chainsaw, plasma rifle, holy water pistol and even Nano Drinks (purchased at vending machines) that imbue your warrior with new abilities. You'll need everything, since the game throws imps, zombies, cacodemons, sentinels, a spider mastermind and other horrors your way. Bottom line, this is a solid game that won't break your wallet at the budget friendly $3.99, but at the same time, it's hard to get pumped for what is essentially the same old thing from id Software. DOOM (DOOM II especially) is immensely popular, but the company's followed the tired space station formula for well over 15 years and it's time for something new. This monotony keeps DOOM II RPG from feeling fresh and exciting. No matter how pretty it looks, this is largely the same old thing. That said, there's no denying DOOM II RPG's overall quality, from the spiffy graphics to the user-friendly menus and controls. 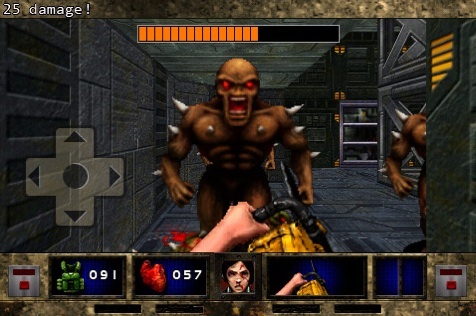 Once again, id Software delivered a top-notch experience on the iPhone that comes highly recommended. Now grab your gear and defeat the forces of Hell. Mankind's survival depends on it. What's Hot: Three characters to play as, over ten different enemies and weapons, plenty of loot, lots of gore, solid turn based gameplay. What's Not: Same old narrative.